Ketotosc Ketoconazole Bathing Bar is a dermatologist approved bathing bar that washes away germs and gives relief from dandruff concerns. One bathing bar for all your skin and hair care needs. 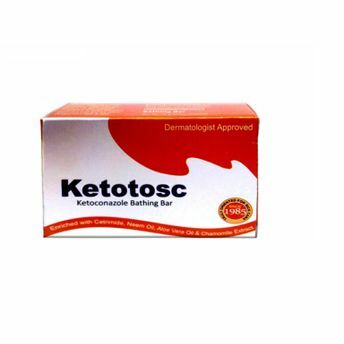 The Ketotosc Ketoconazole Bathing Bar is enriched with the goodness of Neem oil, Aloe Vera oil and Chamomile Extract. This powerful bathing bar has great antifungal and antibacterial properties and helps in managing fungal infections. It relieves skin irritation, infections and also controls flaking, scaling, and itching in hair associated with dandruff. It combines the effectiveness of ketoconazole, a proven dandruff-fighting ingredient, with salon-tested gentleness. Use it just twice a week to wash your head/ scalp to control dandruff. It's gentle enough to use on color-treated, chemically processed, and grey hair, and has a thick, rich lather that rinses clean and leaves your hair smelling fresh. Explore the entire range of Soaps available on Nykaa. Shop more Ketotosc products here.You can browse through the complete world of Ketotosc Soaps .